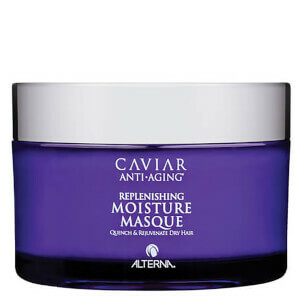 Treat thirsty locks to the Alterna Caviar Moisture Gift Set; a high-performance trio developed with effective ingredients and advanced technology for maximum results. The collection includes a rejuvenating shampoo, a regenerating conditioner and a multi-beneficial cream. A rich, sulphate-free cleanser that utilises Age Control and Photozyme Complexes to minimise the visible signs of ageing and lock in colour. 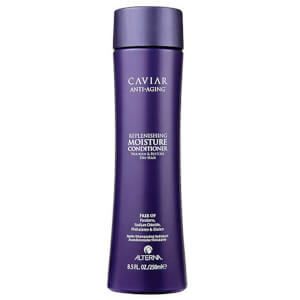 A combination of gentle ingredients such as Shea Butter and Caviar Extract give hair a thorough cleanse while restoring hydration in order to help reverse the damage caused by environmental stresses and heat styling. The nourishing shampoo goes beyond simple moisturising by helping hair attract, retain, and rebalance the hydration it needs. Hair is revitalised and left silky-soft and radiant. 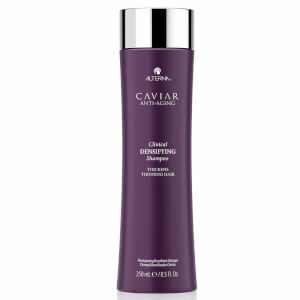 A lightweight treatment that provides hydration to moisture-starved hair, and helps protect from future damage. The nourishing, sulphate and paraben-free formula seals in moisture while defending hair against colour fade, daily stresses and environmental damage. Infused with Age Control and Photozyme Complexes to minimise the visible signs of ageing and a rich blend of lipids to deliver youthful shine and silkiness, the moisturising conditioner leaves locks with colour vibrancy, touchable softness and visible health. Helping to leave hair feel polished and soft to the touch, the CC Cream is a miracle, leave-in product that delivers 10 benefits in just one easy step. Delivering expert help with moisture, shine, smoothness, softness, UV protection, manageability, strength, anti-breakage, heat protection and hold, the non-greasy cream can be used alone or underneath other styling products for a salon-worthy finish. Shampoo: Massage throughout wet hair and rinse thoroughly. Conditioner: After shampooing, massage through wet hair and rinse thoroughly. CC Cream: Apply evenly to clean, towel-dried hair and style as desired. Can also be used on dry hair. Shampoo: Water (Aqua), Disodium Laureth Sulfosuccinate,Sodium Cocoyl Isethionate, Sodium Lauryl Sulfoacetate, Cocamidopropyl Hydroxysultaine, Sodium Lauroyl Sarcosinate, Cocamidopropylamine Oxide, Acrylates Copolymer, Methyl Gluceth-20, Glycol Distearate, Glycereth-26, Algae Extract, Amodimethicone, Saccharomyces/ Magnesium Ferment, Saccharomyces/Copper Ferment, Saccharomyces/Iron Ferment, Saccharomyces/Silicon Ferment, Saccharomyces/Zinc Ferment, Phospholipids, Soy Amino Acids, Sodium Phytate, Polysilicone-15Linum Usitatissimum (Linseed) Seed Oil, Helianthus Annuus (Sunflower) Seed Oil, Hydrolyzed Vegetable Protein PG-Propyl Silanetriol, Glycerin, Laureth-9, Caviar Extract, Butyrospermum Parkii (Shea) Butter, Ascorbic Acid, Superoxide Dismutase, Polyquaternium-10, Trideceth-12, Tocopheryl Acetate, C12-13 Pareth-3, C12-13 Pareth-23, Divinyldimethicone/ Dimethicone Copolymer, Lauryl Alcohol, C11-15 Pareth-7, Butylene Glycol, Polyquaternium-7, Decyl Glucoside, Dihydroxypropyl PEG-5 Linoleammonium Chloride, Guar Hydroxypropyltrimonium Chloride, Citric Acid, Disodium EDTA, Aminomethyl Propanol, Isopropyl Alcohol, Tetrasodium EDTA, Alcohol, Potassium Sorbate, Polyaminopropyl Biguanide, Benzoic Acid, Phenoxyethanol, Methylisothiazolinone, Fragrance (Parfum). Conditioner: Aqua/Water/EAU, Cetearyl Alcohol, Cyclopentasiloxane, Cetrimonium Chloride, Stearyl Alcohol, Behentrimonium Methosulfate, Cetyl Alcohol, Dimethiconol, Wasabia Japonica Root Extract, Foeniculum Vulgare (Fennel) Seed Extract, Chondrus Crispus (Carrageenan) Extract, Hydrolyzed Algae Extract, Algae Extract, Caviar Extract, Linum Usitatissimum (Linseed) Seed Oil, Butyrospermum Parkii (Shea Butter), Helianthus Annuus (Sunflower) Seed Extract, Saccharomyces Lysate Ferment, Saccharomyces Copper Ferment, Saccharomyces Zinc Ferment, Superoxide Dismutase, Lactoferrin, Daucus Carota Sativa (Carrot) Root Extract, Retinyl Palmitate, Phospholipids, Corn Oligosaccharides, Copper Lysl Oxidase, Acetyl Methionine, Acetyl Serine, Amino Acyl tRNA Synthetase, Phytosphingosine, Ganoderma Lucidum (Mushroom) Tyrosinase, Lentinus Edodes Tyrosinase, Glycine Soja (Soybean) Seed Peroxidase, Peptone, Hydrolyzed Soy Protein, Glycine Max (Soybean) Symbiosome Lysate, Pikea Robusta Extract, Adenosine Triphosphate, Niacinamide Polypeptide, Ascorbic Acid Polypeptide, Pantothenic Acid Polypeptide, Papain, Bromelain, Melanin, Melanin Silanetriol, Hydrolyzed Oat Protein, Hydrolyzed Vegetable Protein PG-Propoyl Silanetriol, Divinyldimethicone/ Dimethicone Copolymer, Hydroxyethylcellulose, Cinnamidopropyltrimonium Chloride, Jojoba Esters, Tocopheryl Acetate, Cetrimonium Bromide, Glycereth-26, Glycerin, Butylene Glycol, Propylene Glycol, Propylene Glycol Dicaprylate Dicaprate, PPG-1 Trideceth-6, Polyquaternium-37, Polyquaternium-10, Amodimethicone, C11-15 Pareth-7, C12-13 Pareth-23, C12-13 Pareth-3, Laureth-9, Trideceth-12, Glycerin, Citric Acid, Methylchloroisothiazolinone, Methylisothiazolinone, Methylparaben, Parfum/ Fragrance, Geraniol, Hexyl Cinnamic Aldehyde, Linalool, Limonene. CC Cream: Water (Aqua), Cetearyl Alcohol , Cyclopentasiloxane, Dimethicone, Cyclohexasiloxane, Propanediol, Glycerin, Panthenol, Polyquaternium-55, Behentrimonium Chloride, Algae Extract, Caviar Extract, Tocopheryl Acetate, Polysilicone-15, Ascorbic Acid, Phospholipids, Helianthus Annuus (Sunflower) Seed Oil, Chamomilla Recutita (Matricaria) Extract, Honey Extract (Mel Extract), Citrus Limon (Lemon) Peel Extract, Superoxide Dismutase, Polyquaternium-11, Polyimide-1, Saccharomyces/Magnesium Ferment, Saccharomyces/Copper Ferment, Saccharomyces/Silicon Ferment, Saccharomyces/Zinc Ferment, Saccharomyces/Iron Ferment, Butylene Glycol, Amodimethicone, C11-15 Pareth-7, Laureth-9, Trideceth-12, Isopropyl Alcohol, PEG-4 Laurate, PEG-4 Dilaurate, Caprylyl Glycol, PEG-4, Alcohol Denat., Disodium EDTA, Citric Acid, Iodopropynyl Butylcarbamate, Phenoxyethanol, Potassium Sorbate, Fragrance (Parfum). (10-14-30191). 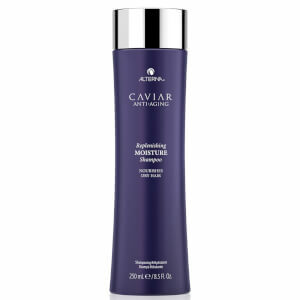 Save 20% on selected Alterna. Discount has been applied to the RRP. Offer valid for a limited time only.